A pub/bar on Camden High Street, which used to be called Liberties but has returned to the pub's original name (therefore not to be confused with the pub of the same name in Islington). This pub gets incredibly packed and very loud on most evenings (including Sundays), and is particularly rammed downstairs on a Saturday evening. It has a late licence until around 3am. 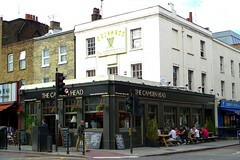 A visitor to the site notes that "the piped music (and hence bellowed conversation) was agonisingly loud, far louder than is typical even of circuit pubs, to the point that the gig we went to afterwards provided relative peace and quiet", though Camden High Street is generally lacking in any cosy, quiet spaces. However, if one visits at other times, there's a fairly large ground floor space, mostly open-plan, with a pool table and some comfortable couches as well as tables. Upstairs is a bookable function room, good for smallish clubs and there are also occasional acoustic gigs and comedy nights. At the main bar, they have a couple of handpulls for ale (Adnam's and London Pride, not always reliably available). Camden Town Pale Ale is available on keg draught, as well as the usual lagers, such as Sagres, Leffe, Hoegaarden, Amstel and the like. Service is friendly. Accessibility: Ladies toilets are upstairs on the first floor, while the gents are downstairs (note also that as of early-2012 they've been refurbished so are of higher quality than they were). There's only a very shallow step to get in. Last visited by Ewan and others, May 2012. Opening hours taken from website, June 2012. Last edited 2013-01-28 16:34:48 (version 12; diff). List all versions. Page last edited 2013-01-28 16:34:48 (version 12).